Another example of an Indian restaurant at a service station, this one on the East Lancs Road leaving Liverpool. There is an unadvertised Tesco (Greenergy)/Tesco Express forecourt with adjacent Starbucks café opposite on the A570 junction. The site is named after the nearby settlement of Windle. After the East Lancs Road was built, some-sort of building (possibly a garage) was provided in the present location of the services. 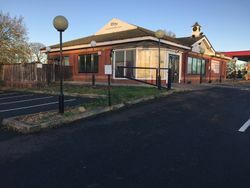 In around 1970, the Knowsley branch of Little Chef opened here. It closed in 1995 but reopened in 2000, before closing again in around 2005. It became Nabi's, then Swaarg, now Diya. 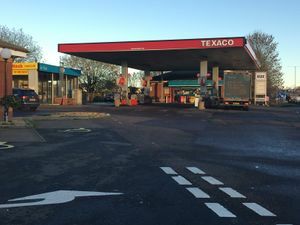 The petrol station used to be branded as Esso, it changed to own brand ELSS (East Lancashire Service Station) in 2012 and then to Texaco in 2014. The shop was formerly branded as Costcutter and then Mace.